There is so much unnoticed talent from strangers that you pass every day. People around the world have talent to write, sing, design, etc. but are never given the opportunity to share their gifts. Giving them the opportunity to express themselves is the first step to finding the next designer. 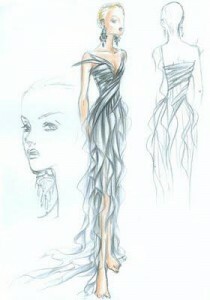 Promgirl.net started a design competition on Facebook and within a few days there were dress designs that would impress Valentino, Marchesa or even Vera Wang. Most sketches were presented in black and white, which left room to create the colors and fabrics in our own minds. The dress I chose to feature reminded me of someone who was elegant and beautiful at any age. If I was a stylist, I would have chosen Charlize Theron to wear this on a red carpet. This would be the essence of beauty if it was done in luxurious silk chiffon. The color is what would make this design stand out. I can’t help but picture this gown in pale pink or soft silver. I love the way the fabric cascades down the skirt, so a stunning stiletto would be a must! Don’t be afraid to share your skills! If you are afraid of rejection or don’t have the courage to share your talents, I have one suggestion for you….TRY! If you are thinking of auditioning for the role in the town play or joining a sports team or entering your design in a competition, you never know what could happen unless you try. Success comes from going for something! Promgirl.net may not have a million dollar prize but we sure appreciate the talent that presented to us from our friends on Facebook. Who knows, you might just be the next Fashion Designer! This entry was posted in Prom Advice and tagged advice for prom, clarisse prom dresses, homecoming dresses, prom, prom dresses, short prom dresses. Bookmark the permalink.